Korpics MC, et al. Cancer. 2017;doi:10.1002/cncr.30719. Concurrent chemoradiotherapy lengthened OS among elderly patients with muscle-invasive bladder cancer compared with radiotherapy alone, according to results from a retrospective study. The researchers identified 1,369 patients in the National Cancer Data Base aged 80 years or older (median age, 84 years) who received either radiotherapy or concurrent chemoradiotherapy for cT2-T4, NO-3, MO transitional cell muscle-invasive bladder cancer from 2004 through 2013. Median follow-up was 21 months. 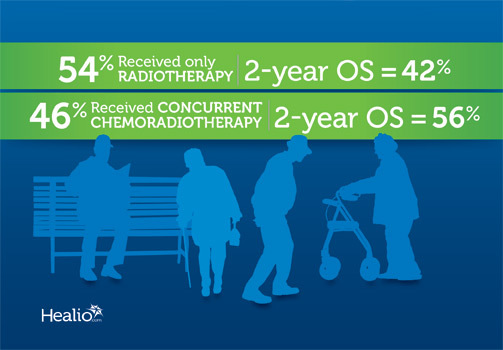 In total, 739 patients (54%) underwent radiotherapy alone, while 630 (46%) underwent concurrent chemoradiotherapy. Patients achieved a 48% OS rate at 2 years. Patients who underwent concurrent chemoradiotherapy showed superior OS (56% vs. 42%; P < .0001). Multivariate analysis showed an association between concurrent chemoradiotherapy and improved OS (HR = 0.74; 95% CI, 0.65-0.84), as well as a higher dose of radiotherapy (HR = 0.78; 95% CI, 0.67-0.9). Patients with T4 disease had shorter OS (HR = 1.42; 95% CI, 1.15-1.76). The OS benefit conferred by chemoradiotherapy remained after 1-to-1 propensity score matching (HR = 0.77; 95% CI, 0.67-0.9).